ArtisTree’s not in business to compete with cutthroats for the hope of landing a two-year account. We’re here to develop long-term relationships, several that have started with clients who were dissatisfied with lowball contractors and asked their property managers to rebid their contract. 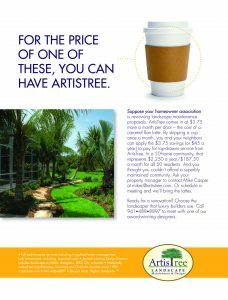 Those who sign on with ArtisTree soon understand and appreciate our commitment to quality and a well-maintained landscape regardless of price. Instead of cutting corners, we do what it takes to deliver exceptional results. That said, our prices are extremely competitive! All you have to do is look at the numbers. But if you’d rather us do the math, we’ll happily oblige. Take a look at how your community can afford the reputable ArtisTree touch. Right click on the ad image to view. Or, contact Mike Casper at 941.488.8897.